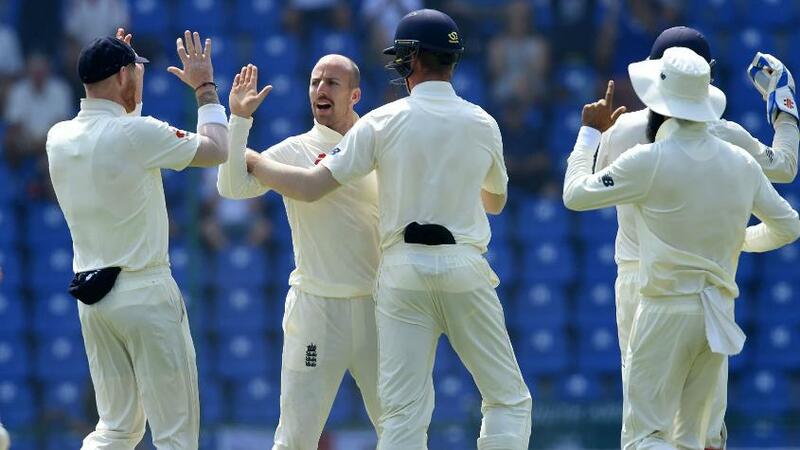 Spin duo of Jack Leach and Moeen Ali share nine wickets between them to bowl Sri Lanka out for 243 in their second innings, securing their side a series-clinching 57-run victory in Pallekelle. Sri Lanka began the fifth day at 226/7, needing 75 runs for a series-levelling victory. Niroshan Dickwella, resuming on 27, looked to play his usual variety of shots – sweeps and reverse-sweeps galore – despite the tense situation. But he was able to add just eight runs to his score before a drive off Ali got his outside edge on the way to Ben Stokes at first slip. Just a couple of balls later, Ali struck again, producing a ripping off-break to go past Suranga Lakmal's defences. Akila Dananjaya looked alright during his short stay at the crease but he was out of partners, left unbeaten on eight, as Malinda Pushpakumara became the final wicket to fall when he spooned back a catch to Leach – a perfect way for the left-arm spinner to get his maiden Test five-for. If Ali's off-spin made the most telling impact later in the innings, it was Leach who set things up nicely for England with quick top-order wickets on the fourth day to severely dent Sri Lanka's prospects. After Joe Root's stunning 124 helped England set Sri Lanka a daunting target of 301, the home side had found themselves in even deeper trouble at 27/3, Leach getting all three of those scalps. Befitting of the drama throughout the match, Sri Lanka were not to cave in without a proper fight – Dimuth Karunaratne and Angelo Mathews scored half-centuries to raise hopes of another twist in the plot. But after Mathews was dismissed by Ali for 88 late on the fourth day, things quickly went downhill for the hosts. Sri Lanka will look for the consolation victory in the third Test at Colombo, starting 23 November. As for England, they will savour their first Test series win in Asia since 2012, and will look to sweeten the deal with a possible whitewash.